Listen to this song by New York-based power pop melody-meisters Fountains of Wayne. It’s “All Kinds of Time” from their 2003 album, Welcome Interstate Managers . Some of the best moments in the world pass us by, and maybe we recognise them for what they were in hindsight. Maybe we don’t even notice them. But, sometimes we catch a glimpse of an important moment when we’re right in it. This is what this song is about. It’s about recognizing that everything, as the moment you’re in ticks down, is about to change for the better. It’s about living the last moments of uncertainty, and watching it fall away as the certainty of a bright future bursts through. One of the strengths of this band, as driven by songwriting team Chris Collingwood and Adam Schlesinger, is that they are able to write every day characters and every day occurrences in their material and make it all seem celebratory, easily identified with, or at very least entertaining even if those characters are not those whom you’d identify with directly. The songs as a result are extremely well-observed slices of life, while also being highly melodic and ‘hooky’ in nature. And this is a very American setting – the college football game, the roaring crowd, the family at home in front of the widescreen TV watching as one of their own wins a key to the happiness he’s pursued. 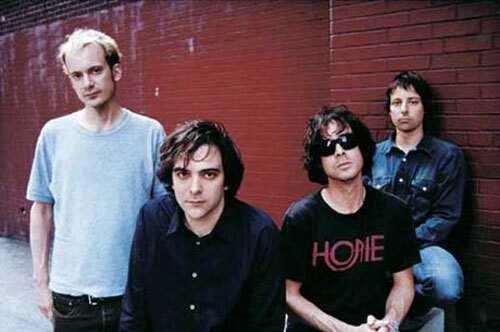 Fountains of Wayne have been around since the mid-90s, with a history ten years older when Chris Collingwood and Adam Schlesinger met at college. When their song “Stacy’s Mom” got airplay (with a video featuring model Rachel Hunter as the title character), and became popular, they were nominated for “best new band” at the 2003 Grammies. After eight years of recording, they were still new, it seems. Their newest album Traffic and Weather is out now. The cynical among us may say that that this is pure schmalz on a Speilbergian scale. Yet, I think that there aren’t enough songs like this in the world. There aren’t enough stories where the good guy wins, particularly not in pop music, which often deals in shadowy landscapes of heartbreak and disappointment. We need those types of songs too, of course. But, I’m glad that there are bands who are writing about life’s triumphs, and doing it intelligently and with humanity, too. For more about Fountains of Wayne, I’d urge you to check out the official Fountains of Wayne website.